Applications Being Accepted: Join Team TRF and run the New Balance Falmouth Road Race! 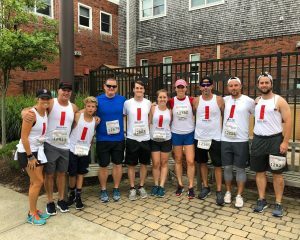 This year, the Travis Roy Foundation is pleased, once again, to be part of the Falmouth Road Race’s Numbers for Nonprofits program. The TRF has 12 charity bibs for the August 18th 2019 race, and asks each runner to donate or contribute a minimum of $750 to participate. Applications are being accepted now, and a decision will be made by late spring 2019. In 2018, our ten runners raised nearly $30,000 to help others move forward, and everyone finished the 7-mile race strong! Thank you to all who donated and cheered! Have you participated in a road race for charity program before? What is the most recent charity for which you raised funds and how much money did you raise? Other charity fundraising programs in which you participated in the past? What will your fundraising goal be? What are some of your ideas for raising these funds? 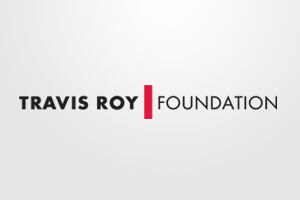 Are you currently affiliated with The Travis Roy Foundation in anyway as a volunteer, staff member, or board member? How did you learn about the team? 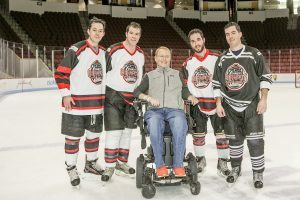 Have you had any experience with The Travis Roy Foundation or Team TRF? Please describe why you would like to run for our foundation. Have you ever participated in a road race before? What is the longest road race you have participated in? example: 5k, 10k, marathon etc. Have you completed a race in Falmouth before? If so, which one. What is the average number of miles per week that you have run during the past 2 months? Please tell us a bit about your current training program. Registration: You will receive your race registration after your application is accepted by Team TRF. All registration details will go through the Foundation and you should not contact the race directly to secure your number. Release Form & Contribution Agreement: In consideration of my accepting this entry, I hereby for myself, my heirs, executors and administrator, waive and release any and all rights for claims and damages I may have against The Travis Roy Foundation, Inc. and its employees, volunteers, and any coaches and consultants and product sponsors for any and all injuries suffered or sustained by me in said event and in the training and planning sessions for said event or travel to and from any of the preceding. I further attest and certify that I am physically fit and have sufficiently trained for competition in this event and a licensed medical doctor has verified my physical condition. I also grant permission for use of my name and/or photograph or voice in broadcast, telecast, print or any other account of this event and agree to waive any compensation for such use. Cancellation Policy: You may cancel your participation with the team, waiving your responsibility for the $750 minimum anytime on or before July 1, 2019. To do so you must contact Foundation staff at teamtrf@travisroyfoundation.org on or before July 1, 2019. After July 1, 2019 you are still responsible for raising the minimum $750 even if, for any reason, you are unable to run in the race. However, your bib can be transferred to another runner up until August 1, 2019. Donations raised and received by The Foundation will not be refunded, even if you cancel before July 1, 2019. Matching Gift Policy: Many companies match employees’ charitable contributions. You can check with your employer to see if your company has this program, and ask donors if their employer has matching gifts. Matching gifts do not apply to the fundraising minimum but are considered over and above the minimum. It is your responsibility to contact the company to provide all matching gift information and insure that the gift is processed. In the situation of a runner who defaults on this agreement, the Foundation reserves the right to pursue collection of the debt and the runner will be responsible for any and all legal fees incurred by the Foundation with this collection proves. In the event of an illness, injury or medical emergency arising during the event or in the training and planning sessions for said event, I hereby authorize and give my consent to the Foundation to secure from an accredited hospital, clinic and/or physician any treatment deemed necessary for my immediate care. I agree that I will be fully responsible for payment of any and all medical services and treatment rendered to me including but not limited to medical transport, medication treatment and hospitalization. Please sign below relative to the terms and conditions set forth in the above-mentioned contract. No runner will be considered without providing the required documentation. I have received the Team TRF application and understand all terms and conditions of my participation in the 2019 program. I am confirming the information listed in the above application is accurate. I have also noted the due date for material submission and fundraising goals. I understand the submission of this application does not guarantee me a spot on the team.